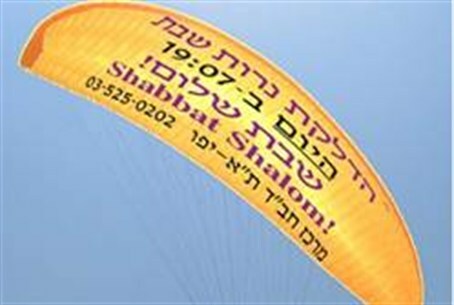 Tel Aviv bathers will see the Sabbath in the sky as Chabad activists’ special glider takes to the air. The Chabad-Lubavitch movement has unveiled a new project in Tel Aviv that will have beachgoers seeing the Sabbath in the sky. The group’s Tel Aviv-Yafo branch has prepared a special glider that will hover over the coastline with the pre-Sabbath candle lighting times printed on its underside, allowing passersby to see when the holy day begins. The new project is part of an ongoing campaign to increase Sabbath observance in the largely secular city. In addition to the glider, Chabad activists have distributed material explaining the holiness of the Sabbath day, put up billboards explaining the importance of Sabbath observance, and spoken to hundreds of families about the mitzvoth (commandments) relating to the Sabbath day. “We firmly believe that every Jew and Jewess in every place, and the precious young people in Tel Aviv in particular, desire in their hearts to observe the Sabbath, a mitzvah which provides incomparable spiritual joy,” said Chabad coordinator Rabbi Yosef Gerlitzky.